I love the morning sun! Here is Jackson at half past eight this morning. 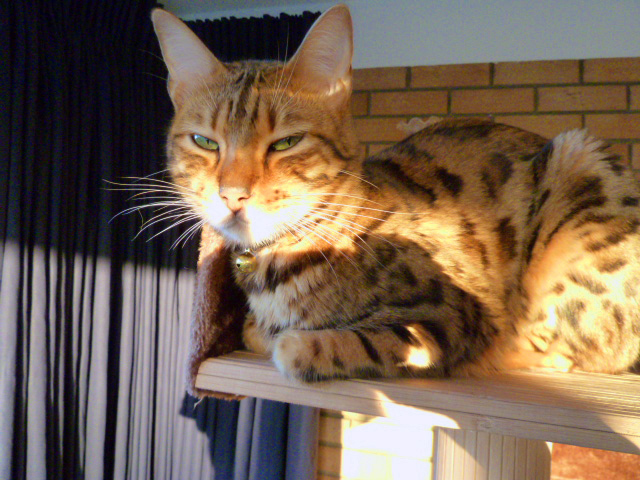 He is on the top tier of his cat tree and get the sun through the window plus the heat rising up from the fire. My brother and sister in law came yesterday and we went to the Three Horseshoes for lunch. I had confit of duck, Anne had sea bass, Peter had fillet of cod and John had goujons of monkfish. I did not have a pudding but Anne had toffee pecan roulade and the men had apple pie with cream and ice cream. Peter and Anne are going to Viet Nam in March. It is a cultural holiday…something to do with tunnels the Viet Kong build during the war? Not my cup of tea…give me the beach and a Margarita! John is shooting tomorrow and I am going to the hairdresser and then doing some shopping. Then back to struggling with my new site….I feel it will never be ready! On Tuesday, Kevin and Joanne are taking us to Smith’s for dinner….a good opportunity for me to mention the a vast amount of Rowan yarn is arriving the next day! Now I must get on – a chinese meal to cook!